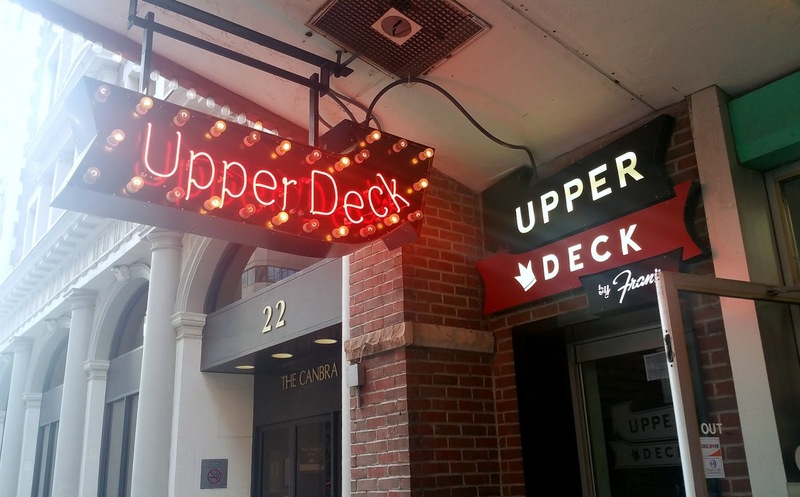 Upper Deck by Fran's, which took over the two upper levels of Fran’s flagship College Street location, is less of a classic diner and more of a casual eatery. Open for lunch, dinner and weekend brunch, the restaurant's menu focuses on Americana and international flavours. 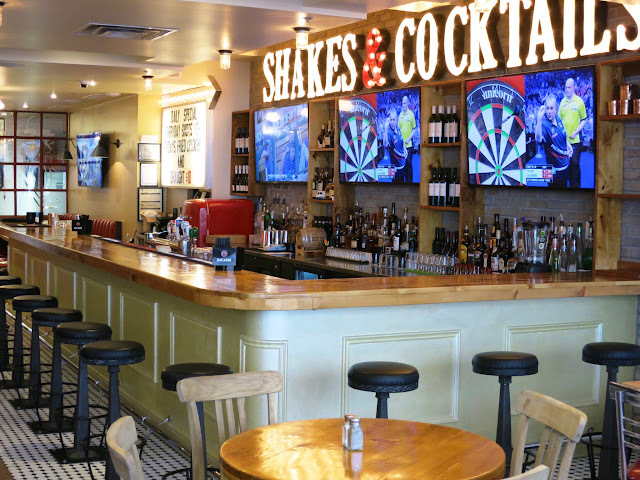 Customers can expect generous diner-style breakfasts and home-style comforts with contemporary twists. The first floor of Upper Deck by Fran's is fully indoor and features a large wrap around bar. 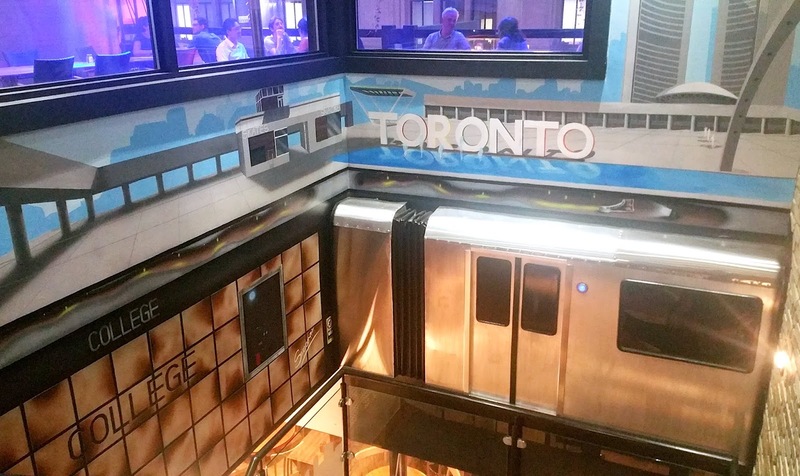 Take a look at this cool art installation of the College subway station on the way to the second floor of Upper Deck by Fran's. 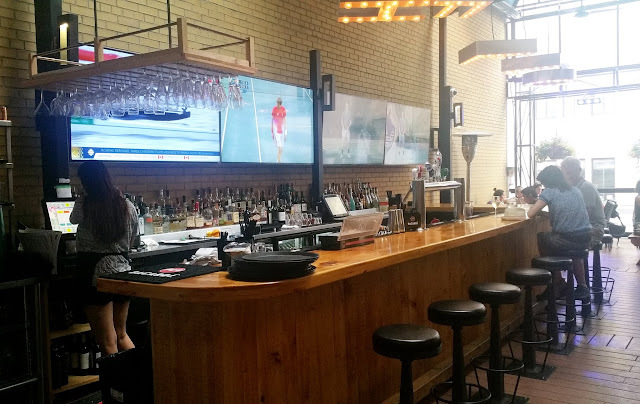 The rooftop patio on the second floor has another wrap around bar with four large flat-screen TVs, which were all playing the Olympic games when my friend and I visited on Thursday evening. The wooden slats and brick walls give the patio a loft-life feeling. 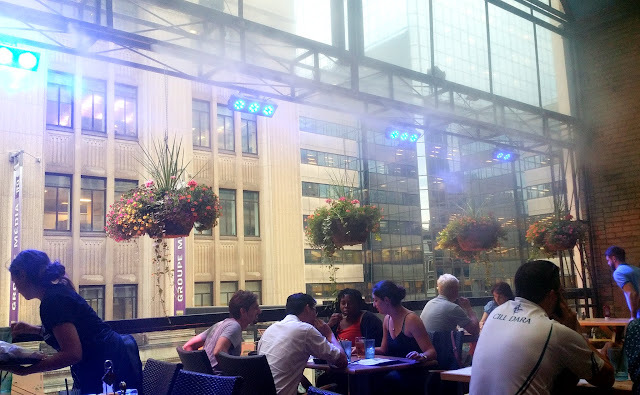 The Upper Deck by Fran's patio is actually an all-season rooftop patio with heaters and a retractable roof. It's pretty laid-back here. There is plenty of communal seating, a.k.a picnic tables, especially towards the back of the restaurant. 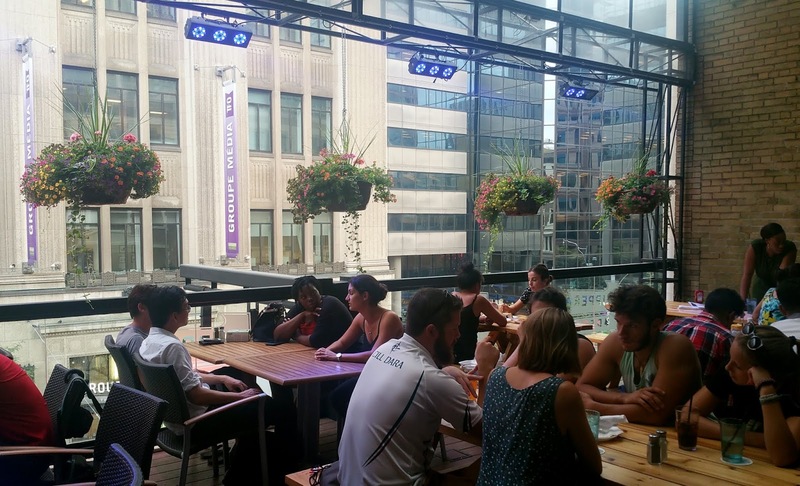 Upper Deck by Fran's offers an extensive seasonal cocktail menu (they grow their own herbs on the rooftop) including classics like the Negroni, Old Fashioned and Cosmopolitan, as well as shareable cocktails such as the Muskoka Mule, College Street Tea and Jack Daniels Rhubarb Lemonade. The random bursts of cool mist feels so nice! 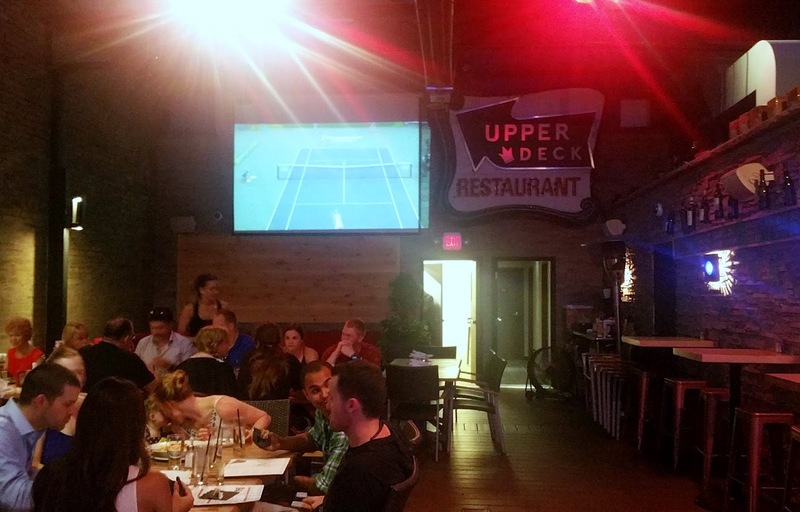 We started dinner with Deep-Fried Ravioli, part of Upper Deck by Fran's $5 snack menu. These raviolis were great, fun bites. 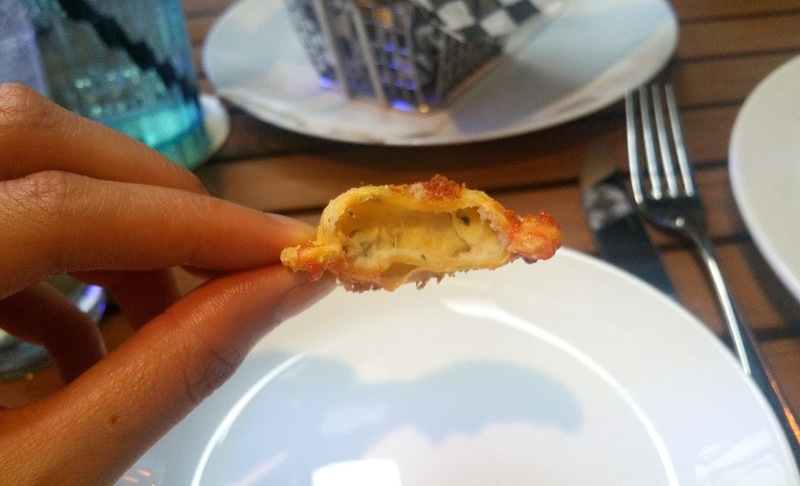 The shells were fried golden and crisp, and were filled with warm cheese. I wish the cheese was more soft and gooey - I think I was expecting a consistency closer the stringy cheese on pizza. The Boomtown Burger was good, real good. Phenomenal, actually. I would go back to Upper Deck just for this burger. Come to think about it, I haven't had a burger this tasty in a long time. With two patties and lemon chicken, it seems a bit overkill and you'd think it's more for show than actual taste, but nope, that's not the case at all. The lemon chicken, which was crispy, delivered a texture contrast and a nice tang to the burger. Cooked to medium, the two patties were juicy (I actually prefer medium rare but it's OK here). With the combination of cheddar, guac and aioli, the entire burger was super delicious. The fries were good too. If you don't think you can handle the Boomtown Burger, you can always opt for the other homemade burgers on the menu that are much less daunting and massive in size, such as their Old-Fashioned Half-Pound Burger, Garden Burger or Fran's famous Legendary Banquet Burger. 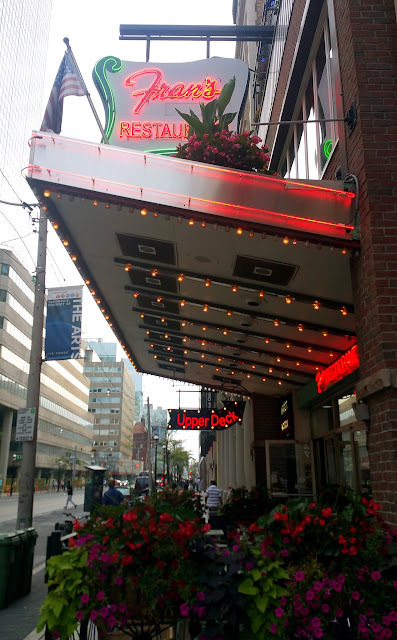 The restaurant makes all their burger patties in-house from scratch every day with AAA Canadian beef. Fried, sweet, savoury and everything in between, this Chicken and Waffle was excellent. Even though the chicken wasn't as juicy as I would like, it was nicely seasoned and crispy-skinned. The subtle heat in the honey maple syrup was the best thing ever. It tied the chicken and waffle together perfectly, with the soft and fluffy waffle soaking up all the syrup. Pie a la mode is the way to go, and that's why I like adding vanilla ice cream to any pie dessert. The temperature and texture contrast is hard to resist. I'll be doing a giveaway for Upper Deck by Fran's next week, so keep your eyes peeled!